Welcome to Peoria Toyota and thank you for shopping with us today. 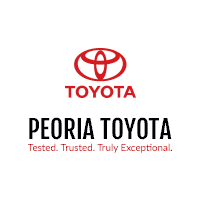 Peoria Toyota has served our community since 1980 and we have a long history of superior sales and service customer satisfaction and giving back to our community. We are excited to help you find the car of your dreams and want to make your experience with us Truly Exceptional. John P. “Jack” Pearl (Founder) Family-owned Pearl Automotive has provided quality new and pre-owned automobiles to Central Illinois for over 35 years. 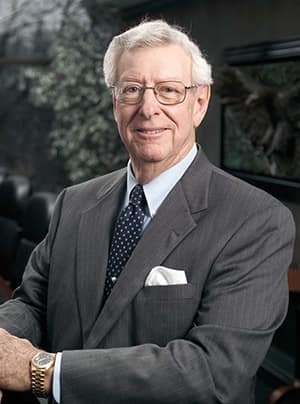 Jack Pearl founded this world-class organization in 1980 on the principle of offering only the most reliable cars and helping consumers maintain their investments through top-of-the-line parts and service. Pearl Automotive has grown over the years and now includes Lexus of Peoria, Peoria Toyota, and Autohaus of Peoria (Audi Peoria, Volkswagen of Peoria, Porsche of Peoria, & Mercedes-Benz). Moving forward, the Pearl Automotive organization will evolve and grow on its experience providing excellence in the industry through quality products and first-class service. Pearl Automotive associates are passionate about their craft, averaging more than 15 years in their positions. We envision a strong outlook for the future of our dealerships, with increased opportunity to serve central Illinois through innovative offerings and unsurpassed customer service. In our 35 years of dedication to the industry, we have illustrated a commitment to growth and plan to continue expanding through acquisitions of dealerships and personnel to meet the increasing needs of our customers. Each year, Toyota Motor Sales recognizes its top Toyota dealerships with the coveted President’s Award. It’s one of the highest honors that a car dealer can receive from Toyota, and is only awarded to those that have demonstrated a commitment to maintaining Toyota’s high standards for customer satisfaction. Peoria Toyota’s staff and leadership is proud that our dealership has been recognized with this award, a tribute to excellent customer relations in sales and service. We are proud to have received the Toyota President’s Award for the 7th Year in a Row 2011-2017!. 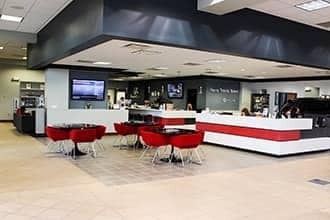 3 Flat Screen TVs, Complimentary beverages and snacks, Business lounge, Toyota boutique, Clean, spacious facilities, Newly remodeled children’s playroom, Free WiFi, Fast, while-you-wait service, Extended weekday hours, Saturday service and parts hours, loaner vehicles, most major credit cards accepted! We are located at 7401 N Allen Rd, Peoria, IL, 61614 and invite you to stop by and enjoy our state-of-the-art facilities. 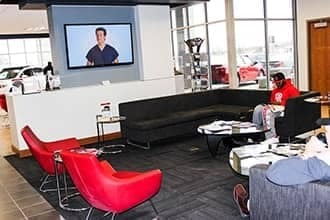 Come shop in one of the finest dealerships around and relax in our newly remodeled Pearl Cafe! 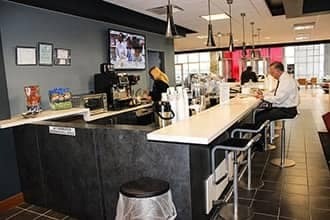 Our cafe provides complimentary coffee, cappuccino, espresso, water, tea, latte, soda, fresh-baked cookies and other refreshments!